Let me say just how pleased we are to have you come visit our little bit of the big world! It's our mission to "share our experiences, so you can make the most of yours." We have plenty of lessons we've learned along the way that we feel can help you make your life better. 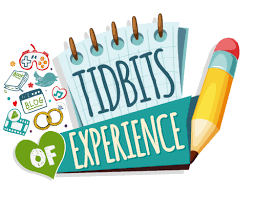 © 2019 Tidbits of Experience. All rights reserved.